At Good Shepherd Health Care System we pride ourselves on being able to provide the latest technology to give you the best diagnostic imaging studies available. After your test is completed the radiologist will send the results to your provider. At that time your provider will be able to send the results to you or review them with you. 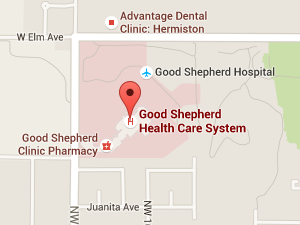 Conveniently located at Good Shepherd Health Care System you can schedule your diagnostic imaging study by calling 541.667.3520. Monday through Thursday, 7:00 a.m. to 6:00 p.m. and Friday 7:00 a.m. to 5:30 p.m.